Students begin the experience with a gripping and perhaps troubling video about the Crusades. They explore more deeply the role and structure of the medieval Catholic Church, the role of religious orders, and the unique situation of Muslim Spain and Portugal. Then they return to the Crusades, describing the effects and explaining their views on why those effects were positive or negative. In this experience, students begin the experience with a gripping and perhaps troubling video about the Crusades. 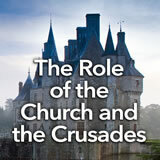 They explore more deeply the role and structure of the medieval Catholic Church, the role of religious orders, and the unique situation of Muslim Spain and Portugal. Then they return to the Crusades, describing the effects and explaining their views on why those effects were positive or negative. This experience contains a lot of content. You may choose to teach it over two sessions in order to spend adequate time on the various elements of the Church’s role in medieval Europe. Explain the role of the Catholic Church in medieval Europe. Describe the structure of the Catholic Church in medieval Europe. Identify key figures in medieval Europe. Describe the Crusades and their impact on medieval Europe. The medieval monk or nun, the pope outfitted in splendor, the Crusader monk, the Muslim sultan—these are character types that have appealed to the Western imagination and become part of a cultural heritage. In this experience, you will learn about the power and the structure of the Catholic Church, the people who served in it, and a movement it inspired—the Crusades. 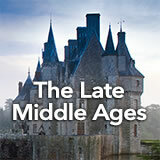 Imagine you are a knight in the Middle Ages—about 1095 C.E. You have spent the past few years collecting rents from your serfs, seizing other knights’ lands, practicing your swordsmanship, and generally terrifying the neighbors. But that’s getting boring. What to do? One day, you hear that the Pope, the head of the Roman Catholic Church, has called on all knights to travel to the Holy Land in the Middle East and capture it from the Muslims who rule it. It’s going to be a long, dangerous, bloody experience. That sounds great! When can you start? The campaign of medieval Europeans to capture the Holy Land was called the Crusades, and you can watch what it may have looked like at First Crusade. Invite students to elaborate on their impressions in a discussion.